Haven’t done a InstaFriday in awhile. Here we go! 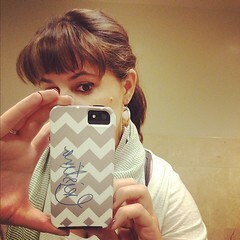 My fabulous new iPhone 5 case from daninotes finally arrived! 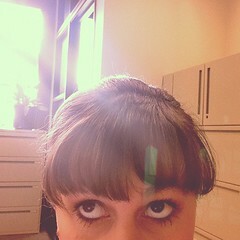 Last Friday I reverted back to my natural hair color with a little bit of ombre and bangs! I haven’t had bangs since 8th grade. Visited to my grandpa last weekend and made a stop at my favorite cupcake shop: Teacake Bake Shop. 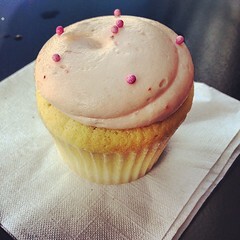 I tried their Strawberry Shortcake Cupcake. It was so yummy! My relatives from back east were out on the west coast right around the time we had our Housewarming Party. 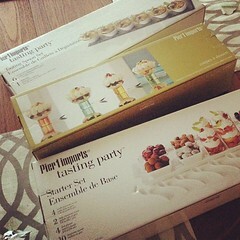 They stopped by to see the new house and gave us a lovely housewarming gift: a few pieces from Pier1’s Tasting Party line. You can also see hints of the super cute placemats I picked up on clearance from ZGallerie underneath.